Overall, it was looking like a fairly quiet week in minor league news until word of the Jake Peavy deal broke. 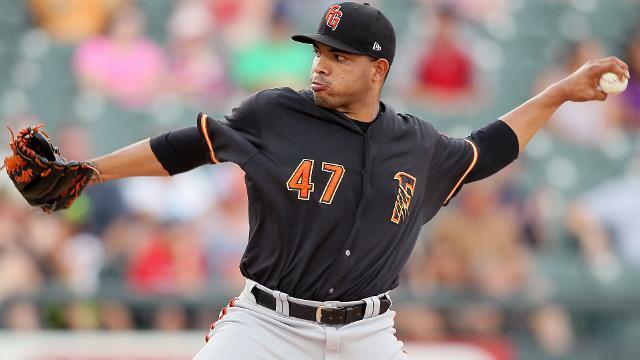 The Red Sox ended up getting two minor league pitchers, 25-year-old right-handed reliever Heath Hembree and 22-year-old left-handed starter Edwin Escobar (pictured, right), in exchange for Peavy. 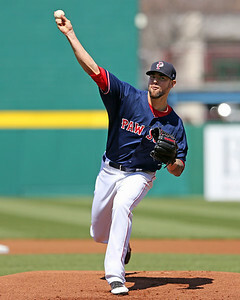 SoxProspects.com staff editor Brian Gagnon has all the details in his write up of the deal. Reviews of the deal were a bit mixed. Peavy was not having a great statistical season going 1-9 with a 4.72 ERA and 1.43 WHIP and thus did not have huge value. Despite this, ESPN Insider's Keith Law believes the Red Sox could have gotten more out of the deal. Likewise the Providence Journal's Jim Donaldson was not impressed with the deal, though I should point out his angle seemed to focus on pure statistics which were inflated for both players since they were pitching in the hitter-friendly Pacific Coast League. At 22 years-old, Escobar is also extremely young for the league where the average pitcher is almost 5 years older. Today MLB.com was the latest outlet to release their mid-season rankings. Their Top 100 featured six Red Sox prospects: 2B/OF Mookie Betts, LHP Henry Owens, C Blake Swihart, 3B Garin Cecchini, RHP Alan Webster, and RHP Anthony Ranaudo. Check out the list to see where these six ranked among the best prospects in baseball. Jim Callis, one of the men responsible for the MLB.com rankings, said on Twitter that he views the Red Sox as one of the top three farm systems in the game currently. Unlike many other sites (not including SoxProspects.com where we constantly are updating our rankings), MLB.com also updates their Top 20 list for each team. Rankings have shifted around a bit, and luckily the Peavy deal happened just in time to see Edwin Escobar make the list at number 10. He was ranked as San Francisco's second best prospect coming into the season. Ranaudo was the last Red Sox prospect to make it onto MLB.com's Top 100 on the heals of an impressive start to July where he has a 2.66 ERA and 1.10 WHIP 23 2/3 innings. In June he was even more impressive, putting up a 1.47 ERA and 0.82 WHIP while holding opponents to a .472 OPS against. Ranaudo spoke with MiLB.com’s Robert Emrich about his impressive run and what has lead to his success. Catcher Christian Vazquez was the highest ranked Red Sox prospect to miss the MLB.com Top 100 rankings. However, he continues to impress as Brian MacPherson of the Providence Journal writes. Henry Owens has been ranked very highly on all the mid-season lists, and SoxProspects.com northeast scout Chaz Fiorino got a chance to get his first live look at Owens and covers it all in his latest edition of The Write-Up. Craig Forde of Boston.com notices there is another Betts making waves in the Red Sox system this year, Jordan Betts. 27 year-old Cuban outfielder Rusney Castillo‘s showcase for Major League teams took place Saturday in Miami, and Jon Heyman of CBS Sports lists the Red Sox as one of many teams in attendance. Photo Credit: Edwin Escobar by MiLB.com & Anthony Ranaudo by Kelly O'Connor.